Lalla was an eighth-century Indian astronomer, astrologer, and mathematician who lived in central India, possibly in the Lata region in modern south Gujarat. Despite the significance of Lalla’s work, very little is known about his life. Lalla did not record any dates relating to his life or work in his surviving treatises. He is generally placed in the middle of the eighth century on the basis of his borrowings from earlier authors and those of later authors from him. He followed the tradition of Aryabhata. His most important work is the Sisyadhivrddhida (Treatise Which Expands the Intellect of Students), which, as he says, was composed to expatiate astronomy as set out by Aryabhata. The Sisyadhivrddhida is in two sections, entitled Grahadhyaya and Goladhyaya. Grahadhyaya deals with planetary calculations, determination of the mean and true planets, three problems pertaining to diurnal motion of Earth, eclipses, rising and setting of the planets, the various cusps of the moon, planetary and astral conjunctions, and complementary situations of the sun and the moon. The second part—titled Goladhyaya deals with graphical representation of planetary motion, astronomical instruments, spherics, and emphasizes on corrections and rejection of flawed principles. It is within Sisyadhivrddhida that the earliest known description of a perpetuum mobile is described. Lalla also wrote the Jyotisaratnakosa, a treatise on astrology that survives in the form of several incomplete manuscripts. This work is one of the earliest known Sanskrit astrological works for determining auspicious and inauspicious times. His works were followed by later astronomers Śrīpati, Vateśvara, and Bhaskara II. Lalla also authored the Siddhantatilaka. He was well known because of twelve instruments which he brought into practice. Astronomer Lalla describes his famous twelve instruments in his book Sisyadhivrddhida. Golo, bhagana, chakra, dhanu, ghati, shanku, shakata, kartaryaha. Pipta, kapal, shalaka, dwadahsa yantrani saha yastya. Translation: Sphere, ring, dial, bow, time measuring water vessel. Gnomon, divider, scissor. Circular seat with central stick, semicircle with stick, combination of sticks, are the twelve instuments along with a stick. The Gola yantra is a type of armilliary sphere used to locate planetary positions. Bhangana is a ring with angular graduations alonge its circumference, it is a type of protractor. Chakra is a circular disk with angular graduations, it is also a type of protractor. Dhanu is a semicircular disk with angular graduations and a stick pivoted at the center, it is a type of protractor with a plumb bob arrangement. Ghati is a small vessel with a hole at the bottom. It was used to measure time. Shanku is a type of gnomon, a long vertical cone used to identify East-West-North-South direction based on shadow of its tip. A special geometrical construction known a ‘Matsya‘ was used for this purpose. Altitude of sun and day time was also measured with this instrument based on the shadow. Shakata consists of two ‘V’ shaped sticks, pivoted at the end. Kartari means a seizer. This instrument is made up of two sticks both pivoted together. 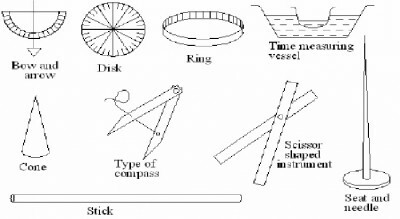 It was used like a caliper, and also to measure angle with the help of protractor. Pitha is a horizontal disk with a vertical stick at its center. It was used to measure local time based on its shadow, it was used to measure the height with the help of special geometrical contruction. Shalaka is combination of two sticks with a string. Yasti is just a long stick having standard dimensions, it was used to measure height and distances. Special geometrical constructions were framed to facilitate the use of this stick. These proposed geometrical constructions were to construct the proportionate triangles with the help of which heights of terrestrial objects could be calculated.